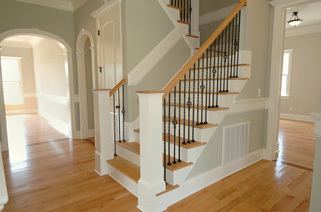 Quality paint work is difficult to accomplish when done without the help of a painting company. Not all companies, however, have the client’s interests in mind when performing the work. A respectable company will have a reputation in the community for the quality of their work. In addition to adding esthetic enhancement, a proper paint job can provide years of protection against harsh weather. Cities in the Pacific Northwest are exposed to some of the most intense daily weather conditions. Frequent rains, fierce snowfall and sharp coastal winds make building exteriors prone to damage. Winter freezing paired with spring thawing can cause paint to peel, flake or bubble. Frigid winter temperatures can even cause exterior paint to change color. This is usually a problem with lower quality products used by unreliable painting companies. Responsible professional commercial painters in Eugene OR, such as Ed and his crew at Affinity Painting, have the experience and tools to provide durable shields to protect businesses and homes. Business owners have many details to manage each day, and having soiled, scuffed or damaged surfaces in the place of business only adds to the strain. In addition, unsightly buildings or their interiors can have a negative effect on how clients and customers view the company itself. Keeping a clean professional appearance gives clients a better impression of the services they can expect to find. Like a residential interior, painters should protect any office furniture or flooring. Measures such as these come from the experience and responsibility of trustworthy commercial painters in Eugene OR. Interior painting jobs are best left to professionals as any flaws made indoors will be much more noticeable to guests viewing walls up close. Residential painting services offer assistance in touching up interior rooms. The company should take necessary steps to ensure furniture and fixtures are properly covered with plastic sheets, while the floors must be protected with thick cloth. Any existing damage to the walls should be filled, sanded or sealed. Exterior painting is much more difficult and dangerous than interior work, thus it should also be left to professionals. Painters can power wash exteriors to remove dirt and debris. Paint can be applied by roller brush or by spray, with fine details covered in small or elaborate areas of the work surface. Homes and businesses in the Northwest require special consideration to accommodate the needs of this region. When choosing commercial painters in Eugene OR, ensure the provider has a history of quality work and satisfied customers.